Heat oil in a pan, add mustard seed,cumin seed, onion, ginger garlic paste saute few mins. Add cabbage, all peppers, red chilli paste & salt. Cook until all done & Finish with cilantro. THat was quick, and sounds yummy. How are you enjoying your holidays? Happy Holidays and wishing you a happy new year. May all your dreams come true. This is so nice:) Happy new year to you! Looks yummy! Simple and nutritious. 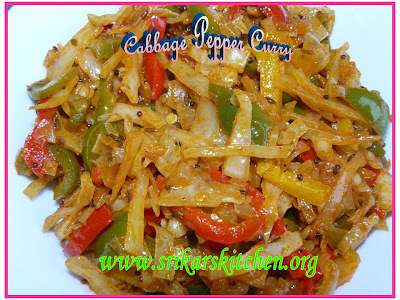 Wow, this is a neat way of making cabbage curry..Looks very inviting too..Will try it..
unusual combo.. never tried this. will go well with rotis i guess. Looks lovely , yum& colourful! Wow that looks so delicious and colorful! A very happy new year 2009 to you and your family! Cabbage and color Capsicums wow yummy and spicy combo. Looks gr8. Wow.. looks Yummy .. Would like to eat now . :0) Have got cabbage and pepper at home will do it tonight. Looks very colourful and yummy! I like how you've prepared the cabbage here, so healthy and flavorful!